Well, the rumors have been rife for some time about disparity between RBR's Vettel car and the rest of the grid. Now it appears some retired F1 drivers and engineers have managed to expose something truly odd going on at RBR only with the Vettel car. A lot of people claimed Webber had sour grapes when he complained of the playing field not being level in seasons gone by. Several race teams who had examine race telemetry could not explain the performance RBR was able to get out of Vettel's car, especially exiting corners. Now it seems they have stumbled over a big clue, exposed by Vettel's huge Singapore race win margin. Traction control has been banned for several years, to ensure that it isn't an issue all race teams use a F1 control package for the engine management. During the F1 traction control years cars had a very similar sound, especially when power was applied as a car exits a corner. F1 enthusiasts will recall that sound, that deep rattle gun like reverberation as the traction control took care of managing the engine power. Now it appears, for Vettel's cars and for Vettel's car alone, that sound is back! The speculation is that RBR engineers have found away around the F1 control package to offer Vettel a traction control advantage over the rest of the field. Ironically for Webber, only the Vettel car exhibits the alleged behavior! Some F1 engineers speculate RBR is using some smart mechanical design so that KERS gets feedback from the suspension loading. Giving Vettel the equivalent of a hybrid electromechanical traction control system. They have offered track audio recordings as evidence. Ironically, a week or so after the rumor surfaced, Webber has ended up on pole and the early reports from Japan are that the Vettel sound has disappeared! In defense engineers from RBR are rumored to have linked the unusual sound to Vettel short shifting due to gear box problems. But in the last few races Webber has also been required to short shift and his car did not exhibit that sound. A fleet of media and F1 connected engineers are now scouring footage and audio from past races and seasons to see if they can find a pattern of audio that will either support or dismiss the speculation. But there is one thing that is confirmed, if RBR has found to have fiddled with KERS or traction control Vettel's car is illegal. Yes it does sound like traction control. Although it also sounds like a very low engine rev, which you'd get from short shifting. I've been to over a dozen race weekends over the years, including in Austin, and the cars have changed dramatically over that time. It would've been around 9 years ago when there was a wet qualifying day and i was on turn 5 ? as listening to the cars coming around. It was very clear to me then that the best cars had the best traction control...and they did sound a lot like that. It was also very clear that some stragglers (jordon/jaguar) had some absolutely rediculous traction control systems. It was so bad and sounded so different that the crowd were actually laughing everytime one of their cars came around. It sounded very sick. Anyway, over the journey you pick up sounds like that and the other time you hear that is when cars are doing their in laps after qualifying, keeping low revs and short shifting on their way back to the pits to conserve their tires and potentially fuel. It is certainly not a sound you hear often on race day, but one you'll here every qualifying day. So as for Vettel and the traction control...it isn't proof he has it, but it isn't proof he doesn't. In short the video is very much inconclusive. I agree, I think without wanting to point the finger the other teams are saying Vettel's car sounds like that while he is doing hot laps and putting +32s on the rest of the field. That is hard to explain if he is short shifting, it is a juicy rumor at the very least, but it does seem to have some substance which is the reason I summarised it here! I read today that Vettel and Ricciardo take breakfast together and share a sense of humour, like best buddies. Careful Daniel, Vettel is obeying the first rule of war and mining you for your secrets of speed! Make sure it's all Quid Pro Quo! I just vomited in my mouth. Sad news reports this morning, Sir Jack Brabham has passed away aged 88. The title "Legend", gets bandied around far to readily these days.......Jack Brabham was a bone-fide legend. A Triple world champion right smack bang in the most dangerous era of Motor Racing there has ever been. Indeed, sad news. He had a good run though. Heard tribute on Triple M this arvo with Skaife telling a few facts about him. His 3rd title was won in a team that he owned, in a car that he built. First and only time that has ever happened. He raced until he was 44, and won a race in that year as well. During his time driving at the highest level, 30 competitors died. It was a brutal sport and he not only survived, but excelled. RIP Does not get the recognition he deserves as a sportsman in Australia. Only 4 men have won more championships. As mentioned, drove in a period it was a death sport. Some of those old time accidents are brutal and really hard to watch. Love to see Ricciardo win as a tribute to the great man. I presume this is the latest F1 thread? Video emerged of the 2nd tractor crash in the F1. Brutal. Hope Bianchi pulls through. Yes, stupid thing is for all the money they spend on the track they don't put collision underride guards on the heavy vehicles. Something so basic that is relatively cheap, is already fitted to many on road semi-trailers, might have made a massive difference. Instead this poor guy gets it in the head from the tractors counterweight. 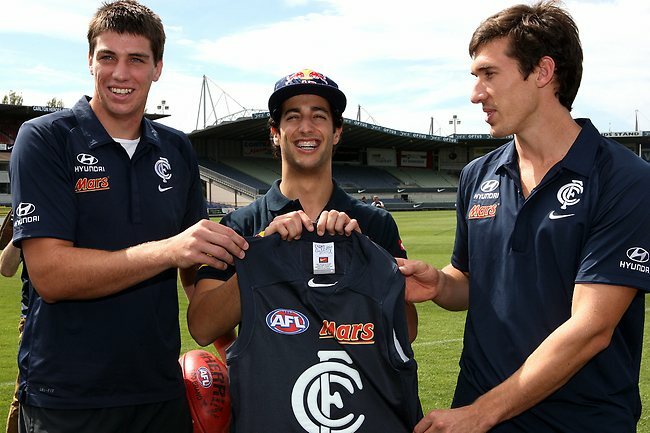 Bit disappointing to see Ricciardo being given the Eagles No.1 ticket! Only a year or so ago he was at Princes Park getting jumpers and the full treatment off Carlton! With a name like his he should be. Should get Juddy to have a word in his ear.